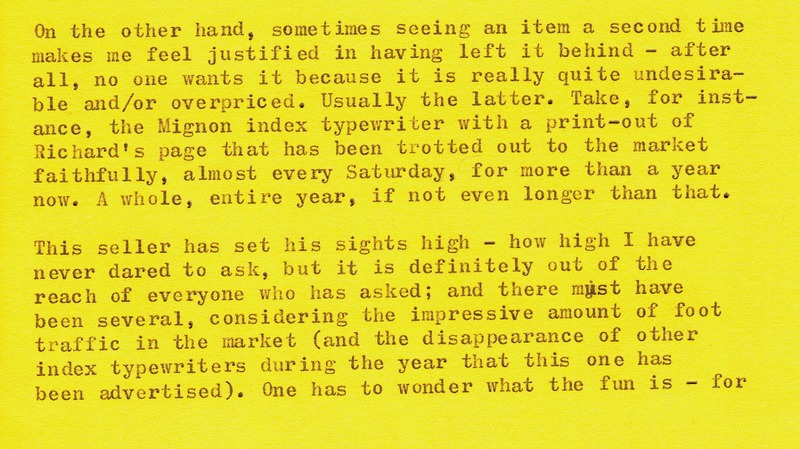 The Mignon Index typewriter makes its first appearance, sometime in December 2010. It is shown with its case, and a forbidding "Do not touch!" sign. In this picture taken a year later (December 2011), the sign has been put off to the side and a print out from Richard's site added. Ah, I see there is a price: CHF 280. I haven't been photographing the Mignon lately, but I have seen it as recently as June 2012, this time accompanied by a Yost. I will keep an eye out to see if it comes back. My first sighting of the Singer 222K, back in early May. I was very impressed by it and seriously considered making the investment. 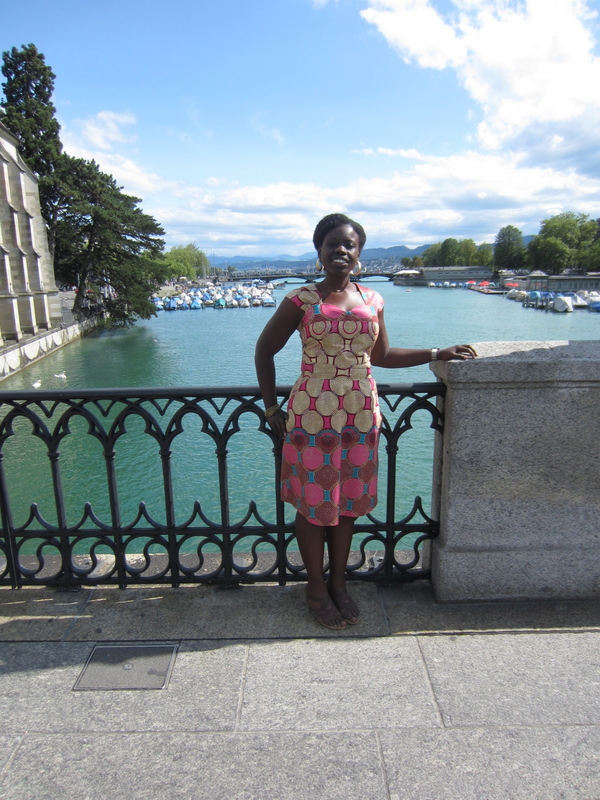 I might have, if I did not know there was another being offered for less in Lausanne. On closer inspection of this image, I realize that the bit of melted rubber has always been there - look carefully at the bottom right side of the machine. I loved that there was a matching Singer spool of thread - like finding matching Hermes ribbon spools, it is a charming detail. 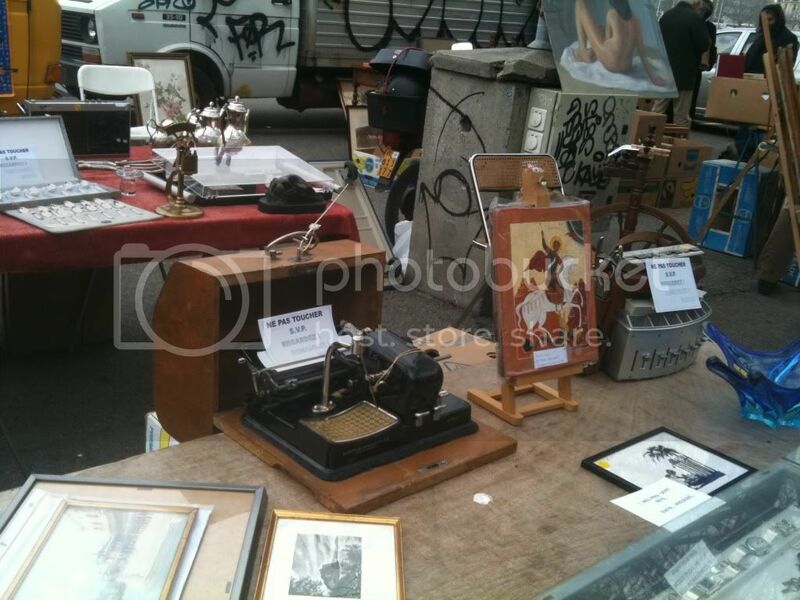 Another day, another sighting of the Singer 222K at the market. Blazing sun, cool weather, occasional raindrops - this poor machine has seen it all. Notice the tell-tale bit of melted rubber: will no one scrape it off and clean her up? She is starting to look rather grimy. 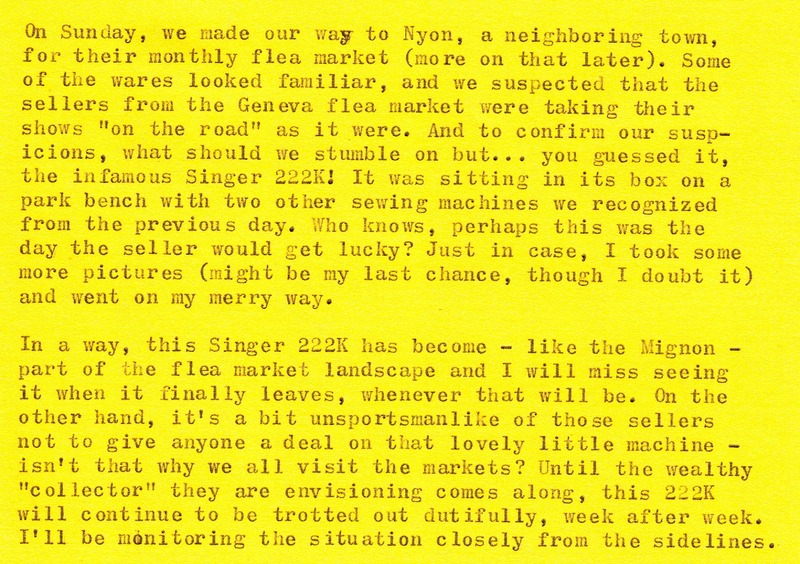 On a park bench in Nyon, the Singer 222K patiently waits (she is sitting between two other sewing machines: the Elna Lotus and a Turissa Ultramatic) to be displayed once more. (Typecast courtesy of Optima Elite). Examining the Bernina Record 730 in the seller's garage, and watching him test it out. I had initially been interested in the other machine just out of the frame, a Bernina Minimatic 807, but he quickly convinced me that this was in far better condition and a better deal overall. I have been using this almost daily since I brought it home almost two months ago, and it has lived up to its billing. Made in Switzerland circa 1969, the Record 730 was the top-of-the-line Bernina sewing machine and came with lots of fancy features - 20 embroidery stitches, automatic buttonholes, option of dropping feed dogs - that I have yet to use. The free-arm is supplemented by a removable extension table for sewing larger surfaces - I use it like this most of the time. Not pictured are the foot pedal, original manual, and lots of presser feet and extra bobbins that came with the machine. Aesthetically, I find it really quite nice to look at. A bit intimidating at first, of course, until you figure out what all the different knobs do and get used to it. Now we are good friends. The rounded curves remind me of the design aesthetic of typewriters from the same period (think curvy Hermes 3000) and in fact this is in sharp contrast to its boxier successors, the Bernina Record 830 or Bernina Record 930. This machine has spoilt me for any others, really. 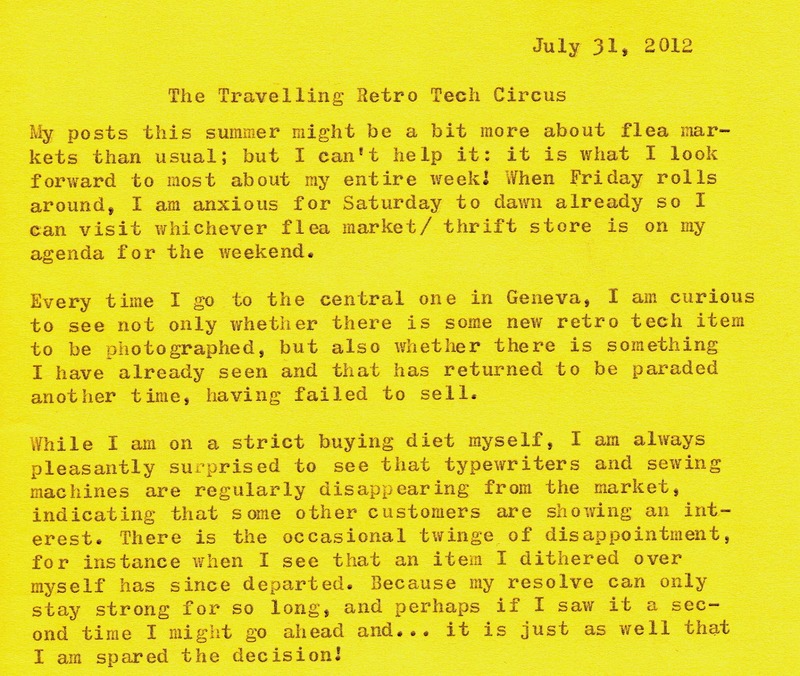 It has worked so wonderfully well "out of the box" that I thought surely others must be the same and have tried my luck on a few more vintage machines, with mediocre results. 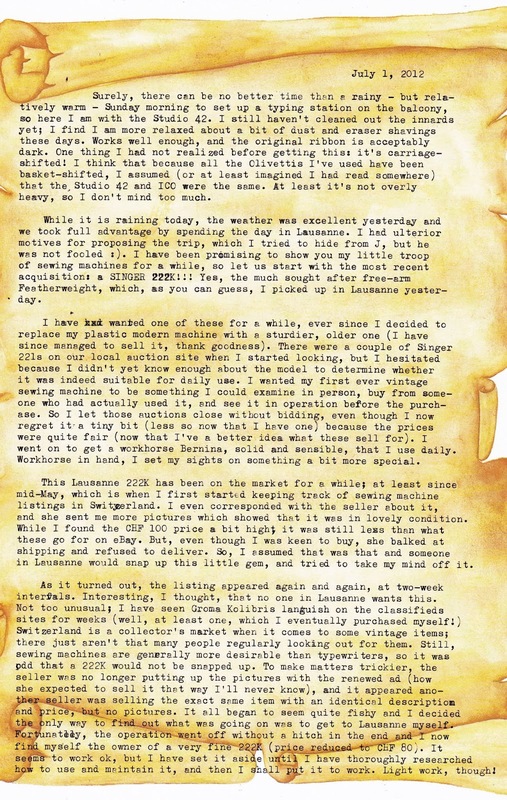 Part of it is surely that I bought it from a seller who has lots of experience with sewing machines and made sure this was in fantastic form - he was so confident, in fact, that he emailed me thirty days after the sale asking if I wanted to return it and get my money back. Not a chance! A look under the hood - there is a lot of impressive engineering to see here, and the nice part is that virtually all of it is solid, durable metal. 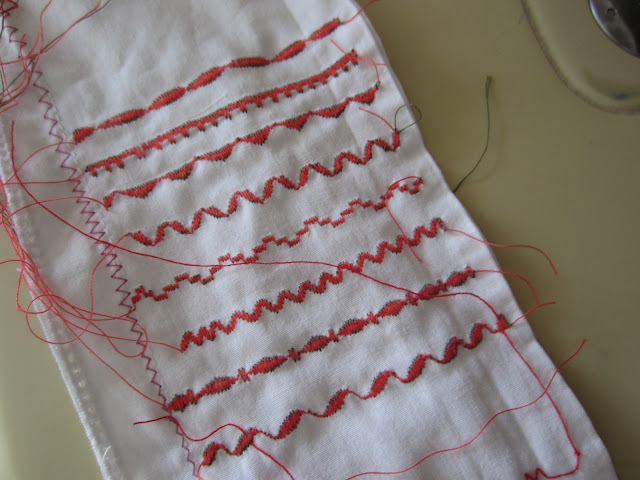 The red dots mark the oiling holes, and the stack of cams in the middle are for the different embroidery stitches. 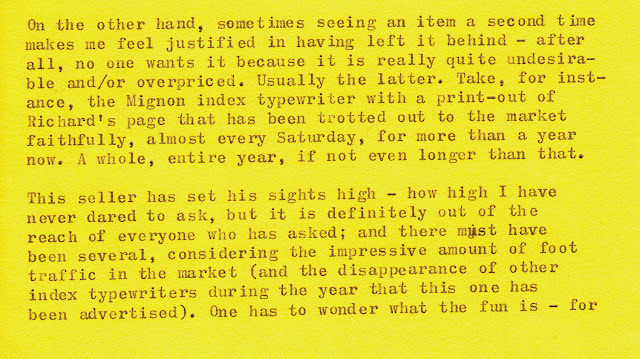 I gave them a try when I first brought the machine home - an advanced typing sample, if you will. Works beautifully. Haven't had a chance to use them in an actual project yet, but perhaps one day. Voila! Sewed entirely on my fabulous Bernina Record 730. The thrift store did yield at least one unusual - and really cool-looking - '50s sewing machine from Italy, a two-tone Vigorelli. An ornate Original Victoria hand crank, which at almost CHF 300, I was sure had become a permanent fixture at the store. Beautiful decals. Back in Geneva, this sturdy Pfaff 130 has been at our Salvation Army for a few weeks. First with the table, but then I just discovered someone bought the table from under it and left the machine forlornly resting on a bench. Ah, well, can't save 'em all. A very interesting Hermes 2000 - from the '30s - '40s, when they were mostly all glossy black, but this one had dark green crackle paint and green keys! Absolutely stunning, but hard to photograph in the glare of the sun. The CHF 40 the seller was asking didn't seem too bad, either. Another green beauty from the '40s was this Bernina KL117, one of the very first zigzag sewing machines made. I am learning a lot about these and I am pleasantly surprised by the good variety of machines that turns up locally. Take this Singer 320k, or example, which I gazed wistfully at for a full five minutes, even engaging in idle banter with the seller (who was asking CHF 150!). At that price I could only afford to look - and I made sure to take lots of pictures too. Love the pastel paint. 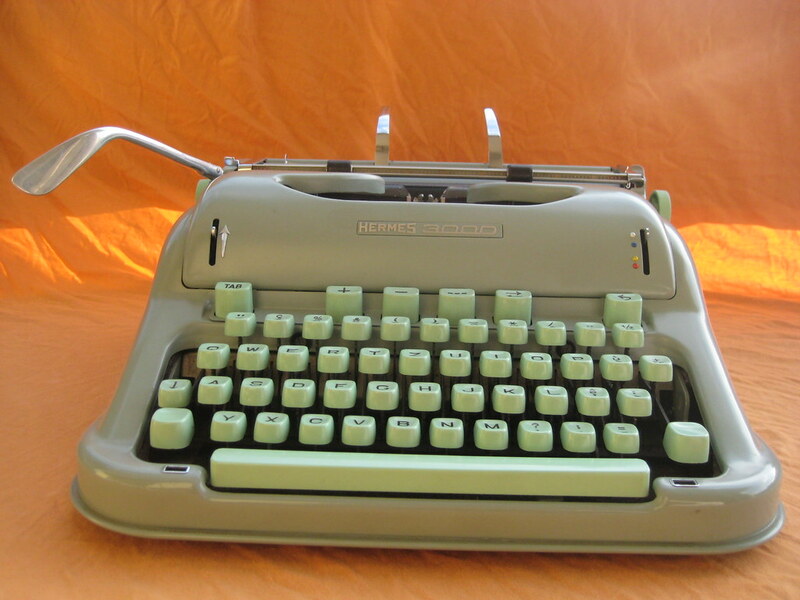 Unusual and well-priced typewriters have been a bit scarce lately - this perfectly ordinary, if well-preserved, Hermes 2000 was being offered for CHF 80. This Dora was less expensive, but still not quite a steal at CHF 25. What was under this dome? 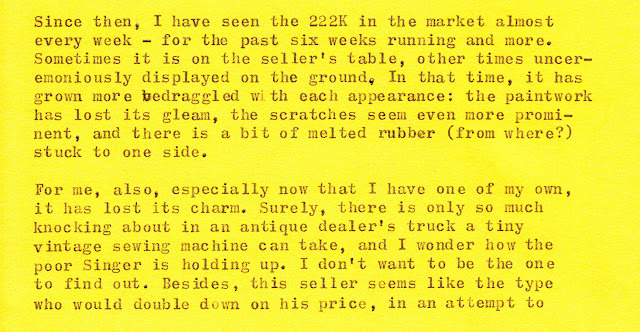 It shall remain a mystery - I was fairly certain it would turn out to be a very interesting typewriter - this one, in fact - but the seller claimed he could not open it and did not care to interrupt his conversation with his colleague about their upcoming pizza lunch to help us figure it out. 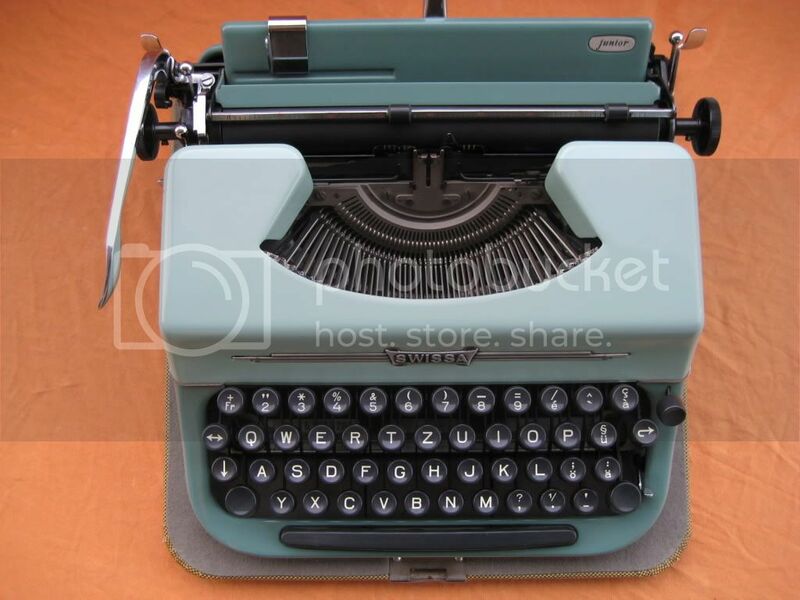 Now that I see the Typo on Typewriter House Collector's site, I'm a bit bummed I didn't get to take a picture of it, as it is certainly photogenic! 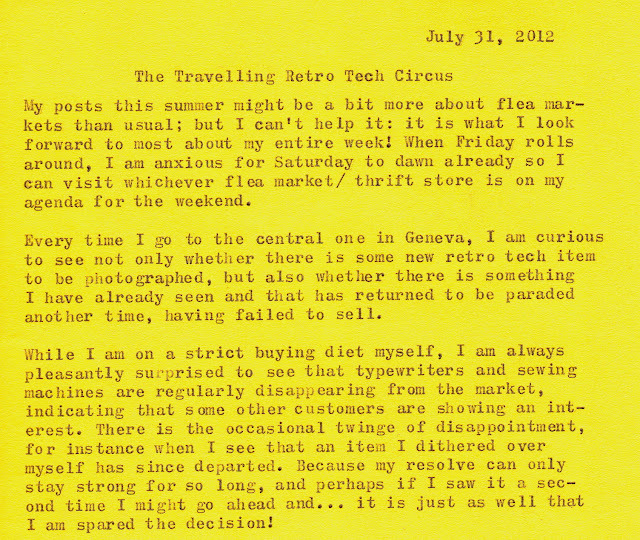 I have a lot of typing to catch up on, but since I'll be on the train for six hours this weekend, I plan to revive my fountain pens for a couple of long-overdue letters and perhaps even a pencast or two. Happy Friday (in advance), all! Remember this Voss? I brought her home on Thanksgiving Day last year, but there was nothing to be thankful about once I tried her out. 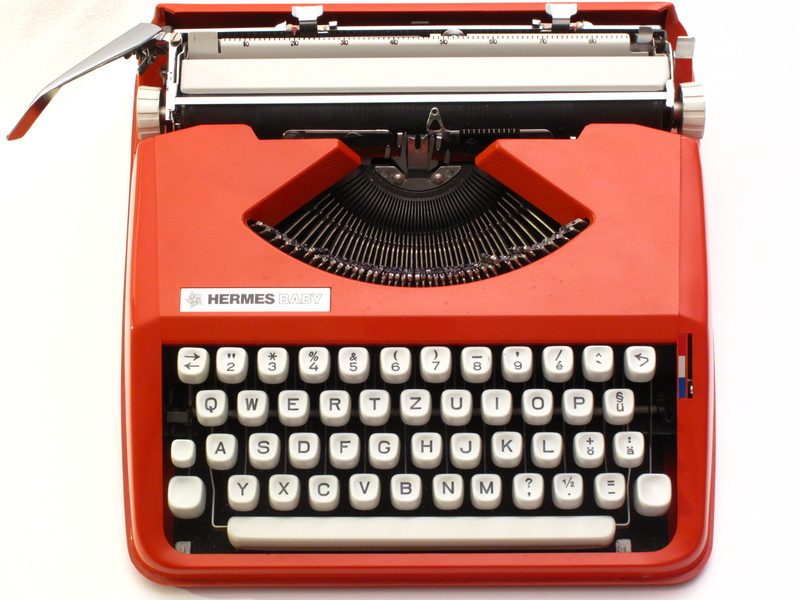 It looked pristine, clean and glossy with no signs of rust, but it simply refused to type. The type slugs hovered just shy of the platen, and despite several attempts at repair, even cracking open the case to get to the inner workings better, we just couldn't get it to work. It seemed we were lacking some vital tools needed for the job. So, in March of this year, I took it up to Basel to give to Georg. I figured if it was beyond hope, he could use it as a parts machine. But, within a few hours of taking off its case, he fixed it! And sent me pictures of it typing - I could hardly believe it. I was sad not to have gotten to use it - I still couldn't say I had ever used a Voss - but Georg seemed attached to it, so I resigned myself to letting him keep it. But then, last week, as Peter traveled from Basel to Geneva, Georg gave him the Voss to return to me. SUCCESS!!!! Finally, I get something right for once. It was a simple fix, but still felt odd at the time - I was sure I was breaking off the lever and didn't think what I was doing could possibly work. But I kept at it, gently but firmly, trusting that I would feel when it really was going to fall off. And after each attempt I would test it again to see whether it cleared... and finally, it did. I can return the carriage using the lever, as intended. It is still a bit close, but the few millimeters is enough to save the (rest of the) paint finish from further scratches. Mold! Unfortunate, but I suppose I could see how it happened. Still, this has never happened to me before and I wasn't sure whether to discard the whole roll. In the end I figured there wasn't much damage a moldy ribbon would do to the inner workings of the typewriter (type slugs can always be scrubbed) and so I cut off the mold and used it anyway. Test of ribbon. Looks fine, all things considered. I should spend some more time coaxing the letters into alignment - the top of the "h" never seems to print well and the "v" still sticks, but we are really 98% of the way there to having a solid B+ typer, maybe A-. What I loved about this typewriter when I received it: the original duster and cleaning brushes. I might repurpose this cleaning kit for my sewing machines; it is too nice to be left to linger in the box (all my Hermes brushes are shut up with their respective typewriters, for example, and are rarely used for anything). And, finally, the case itself. Handsome, bulbous, and really quite large. Seriously, I have sewing machines that take up less space. Voss S24, old chap. Good to have you back. For now, anyway. The very well-maintained case, always a good sign. Neatly nestled in the box, with the accessories and other ephemera. 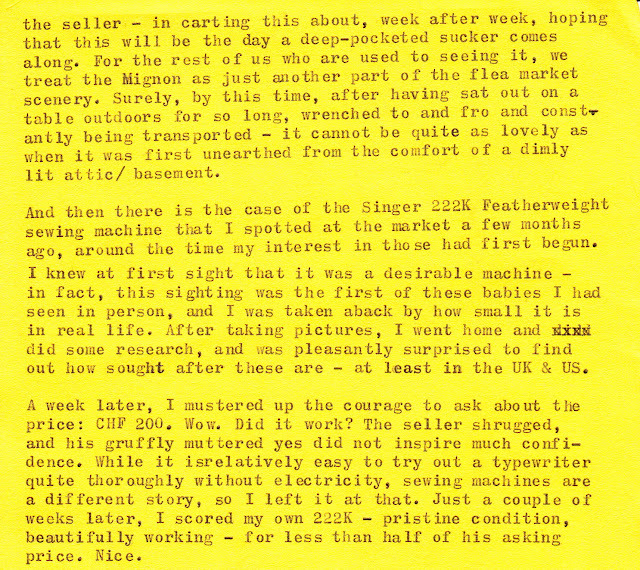 I have to say that despite the name "Featherweight", and all those ads showing finely-clad ladies hefting one up in the palms of their hands, I did not find this all that light - well, definitely not in comparison with a portable typewriter. It was relatively comfortable to carry, and we did not have too far to walk, but I was still happy to set it down when we got home! And... here she is. 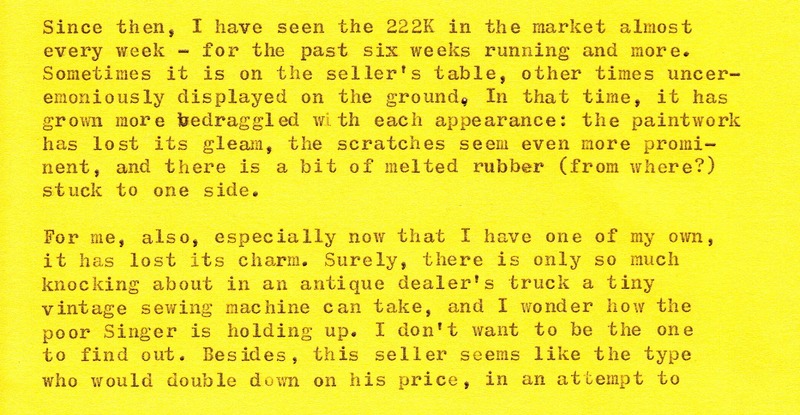 I would rate the condition at 8.5 out of a possible 10; the seller billed it as "new", "sparingly used", etc, and it shows. There are a few scratches, one small crack near the light, but everything is generally clean and free of corrosion. A close-up of the badge. 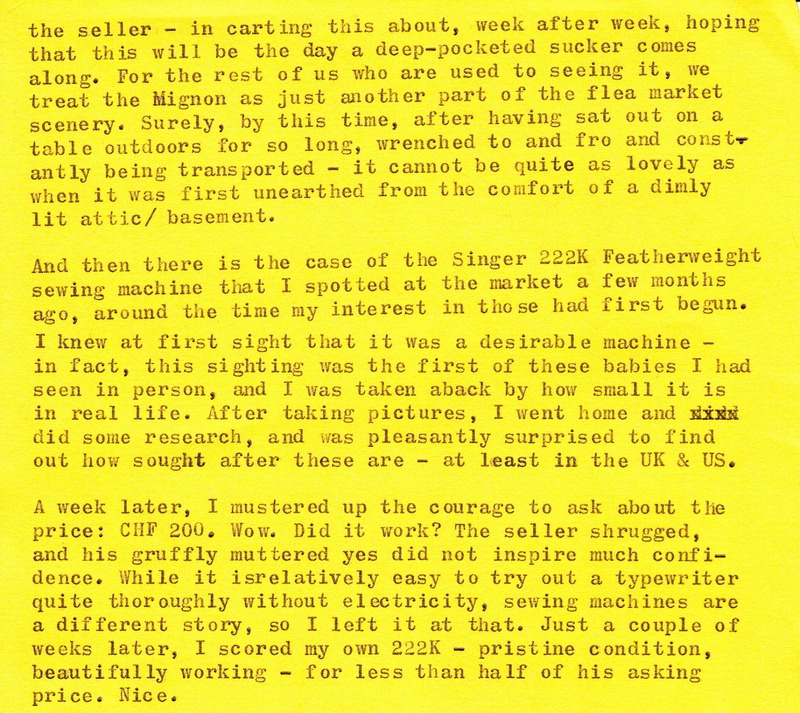 From the serial number, EJ267332, it would appear this was manufactured sometime in November 1953. 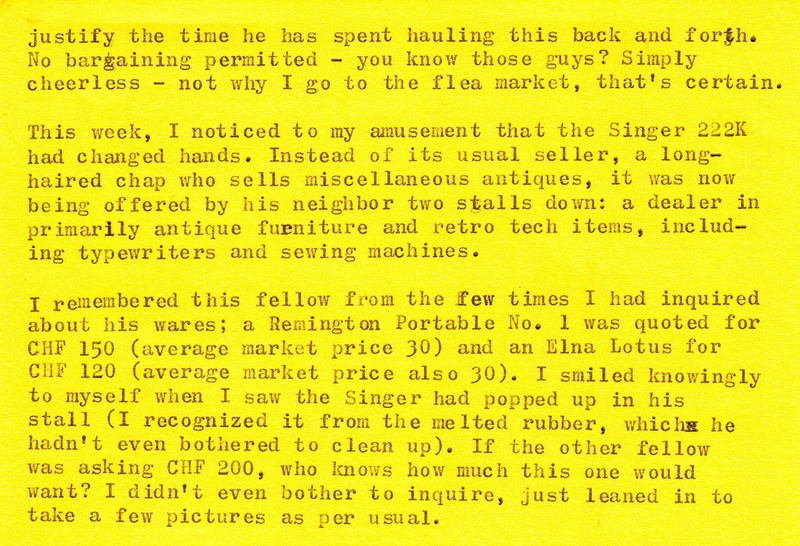 The extras in the case included original Singer Sewing Machine Oil and Motor Lubricant, a Singer-branded seam ripper, instruction manuals (in French) for both the 222K and its earlier counterpart the 221K, and lots of attachments and accessories as well as a Singer ad. Spare bobbins, keys for the case, and special feet - ruffler, hemmer, edge-stitcher, and a few others I'm still figuring out. No zipper foot or buttonhole attachment though, I'll have to source those later if I decide I want them. 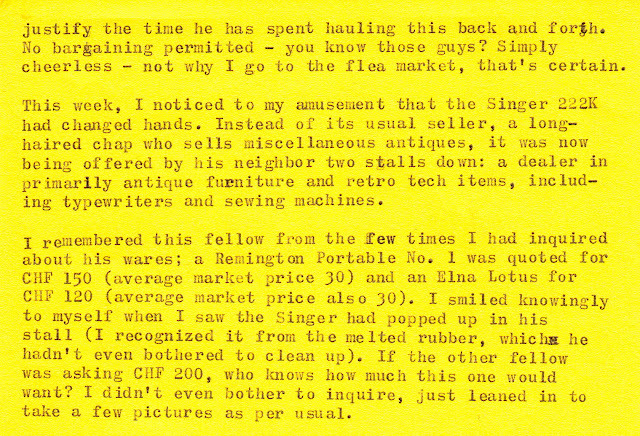 The other side of the Singer 221 ad that came in the box. Foot controller, box with attachments, and a brown paper bag that seems to date from Singer's centennial year of 1951... perhaps the owner bought something in the singer store and it was packaged in this bag? Quite the contraption, indeed. Those gear-like discs are cams that enable one to change the zigzag pattern. I should study the manual carefully - fortunately, it helps that I have also downloaded the English version. This evening, we lubricated it and ran it for a while with some test fabric - it works. I have to sort out the lower (bobbin) thread tension, and the motor emits an initial puff of smoke that is a bit worrying (but from what I have read, not unusual for a machine that has been sitting for years). It is supposed to clear up with a bit of use, so I'll hope for that. For someone who has been decidedly mediocre at typewriter repair, I am even more helpless when wiring is thrown into the mix, so I'll just knock on wood and proceed with caution. 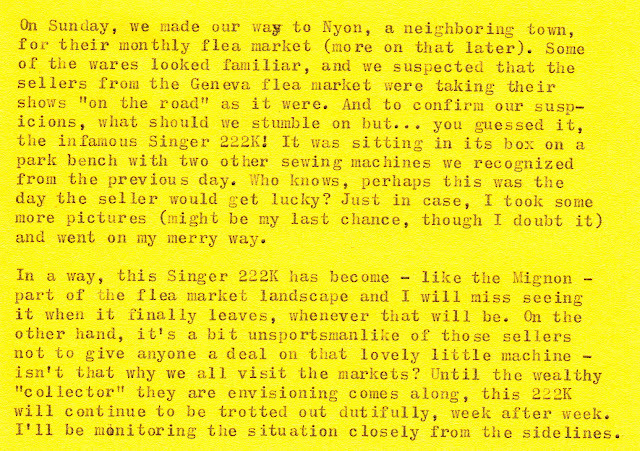 Whatever happens, though, I still think it was a fairly good deal - especially with all the ephemera and extras - and I am thoroughly pleased to welcome it to my small sewing machine collection.